Mandar Pravat is located in Banka District in Bihar. The holy mountain is around 45 km south of Bhagalpur city. It is believed that this Mandar Parvat was used by Devas and Asuras during the churning of ocean, or Samudra Manthan, mentioned in Hindu Puranas. There is a Lakshminarayan Mandir located on the foothill of the mountain. The temple s surrounded by paapaharini kund (sacred water body). It is believed by people here that the Mandhar hill is erected atop Kurma Avatar – the tortoise incarnation of Lord Vishnu. 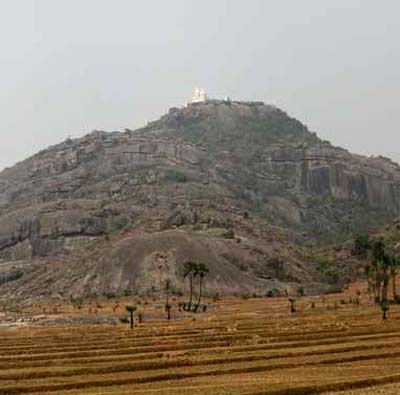 Other holy places atop the hill are Sita Kunda and Narasimha Cave. Head of Madhu Demon can be seen near the cave. Legend has it that Bhagavan Sri Ram, Mata Sita and Lakshman visited the cave during their exile period in the Ramayana. In the Samudra Manthan, Snake Vasuki was used as the churning rod. The patterns that are visible on the mountain is believed to have been created by the serpent when the churning took place between the Devs and Asuras. A huge fair is organized here during Makar Sankranti.